you can sit tight, because the batch of insiders from the world of Factorio development are here. Factorio is kind of lighthouse that we need to keep an eye on. Always. The last weekend I wanted to clear my mind from the computer fiddling so Tomas had to stay home. This week we switched and I'm the lighthouse keeper now. We need to plan this way when thinking about the holidays as well. There are lot of things that just need to be taken care of, the potential website problems, the customer support, the occasional payment disputes etc. I'm not sure what will the future bring, but being available at least half of the time seems like our destiny for now. Although we were always aware that we need to have healthy bodies to keep the spirit strong, we didn't act up to this well enough the last few months, mainly because of the overwhelming amount of work we had to do. I also realized that my weight went up compared what I'm used to. So we decided to change our habits. Tomas started to do Yoga almost daily, and I found a personal trainer/physiotherapeut and I'm training 5 times a week in a gym with him. It is a month now since we started and we both feel much better, optimistic and stress resistant now. We are now starting the phase of preparations for 0.10 experimental release. As always in this phase, we have to move all the bigger tasks that we optimistically hoped to do in this version to the next one and start solving the smaller issues. Our Bug reports section will require a lot of work to get cleaned. One of the biggest task of this release was stabilising the replays, this task still isn't done, but I hope we are really getting there. The parallelized map generation is now fully deterministic and replay friendly, and basic freeplay replay tests seem to work. Now we are testing the replay compatibility between platforms, which requires some fixes as well. I'm quite sure that the replays are not going to be 100% stable in the early experimental releases, but at least it is going to be stable enough to make it sense to let others test it. 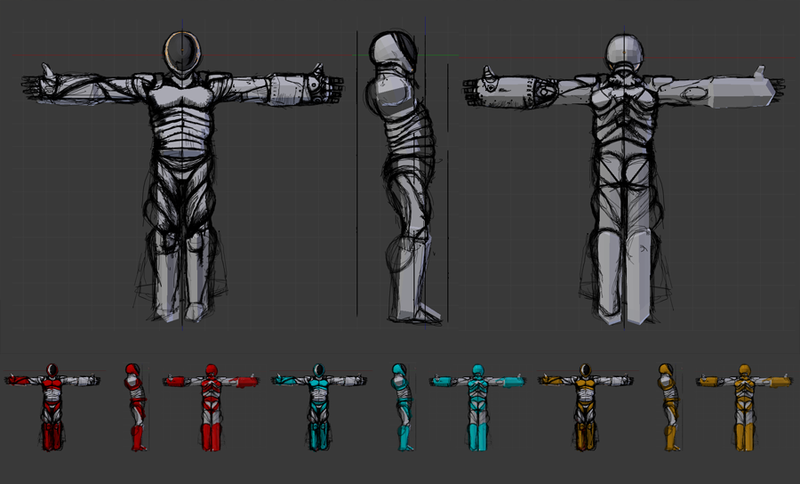 Sketches of one of the possible variant of future player models by Albert.